I have yet to get into a taxi that doesn’t smell of cigarettes. My housekeeper earns more money than some doctors in the country. My son taught himself how to ride a bike by the third week we were here. The ATM machine ate my debit card because the bank doesn't let you choose your own pin code and I can’t seem to remember mine. I thought of writing it on the card, but I’m debating how wise that would be. I ride the train often and always hold my breath a little when things get crowded. The shuk is my happy place and I eavesdrop on the conversations of retired men who linger over espresso and pastries at Aroma Café. They’re usually debating religion, politics or soccer. The three subjects that will get any Israeli riled up. I’m offended by the Israelis' brazenness yet marvel at their true grit. Though my roots aren’t far removed, I know I could never be truly Israeli but I offer a smile wherever I go and maybe, just maybe, it will be reciprocated. Because life here is hard. And I see the people around me hustle through with faith and humility even though it's tinged with some angst. My kids play with childhood abandon because they’re unencumbered by a loaded school curriculum. They have a little more freedom to explore and enough friends at their disposal to do so with. They've built forts, taken apart an old washing machine and turned styrofoam into snow. Best of all, they’ve been truly unplugged and I’ve seen the fruits of that decision. Save maybe for the time my son, by his own initiative, decided to exploit his newfound bike-riding skills and we found him in the neighborhood over after searching for close to an hour. I won’t tell you where a mother’s mind goes in those endless minutes. In retrospect, it was heartening to see how forty or so of the neighborhood kids organized a search party. I have warm, generous neighbors who are always available to lend a bag of flour, or a few eggs, or sandwich bags. It comes in handy when I'm prepping lunches while baking past twelve midnight and I realize the egg man didn't come this week and I used the last two for my morning breakfast and that my baby dumped all the green hued plastic bags into the trash. Better even is when I'm lending things out and then I get a sample of something delicious to taste in return. There are all types and stripes of Jews living here. I can’t tell you where I fit in amongst the clearly labeled categories society has assigned, I haven’t figured it out. I probably won’t. But I can tell you that I’m nestled safely among family. It sounds cliché but totally real when you live here, because this is our true home. Ok, we’re staying. Even if we don't, I will always know what I'm missing. Let’s talk about these keftas. Of course Israeli food is a cross-cultural mish mash of Arab and European foods despite some people’s attempt at dispelling it as misplaced attribution. Hello! Jews lived in Arab countries for centuries before coming to Israel. They ate similar foods! It’s as much our cultural heritage as it is theirs. I realize I’m preaching to the choir, but I felt the need. Yes, the keftas. These are what my summer grilling memories are made of. And on these cool, dreary days, I thought it a good idea to bring the smoky, charred taste indoors to warm things up. I believe keftas should be loaded with garlic and herbs. It’s the only way. I’ve also added roasted artichoke to the tahini for the extra taste that makes you wonder how it’s pleasantly different. Cut up veggies are a must and easy to arrange on a plate. They go straight into the za’atar laffa for a fresh crunch. A stellar dinner to bring a little bit of Israel into your kitchen. In a small food processor, finely chop the garlic, parsley, and cilantro. In a mixing bowl, mix the ground turkey, garlic/herb mixture, cumin, coriander, salt and pepper. 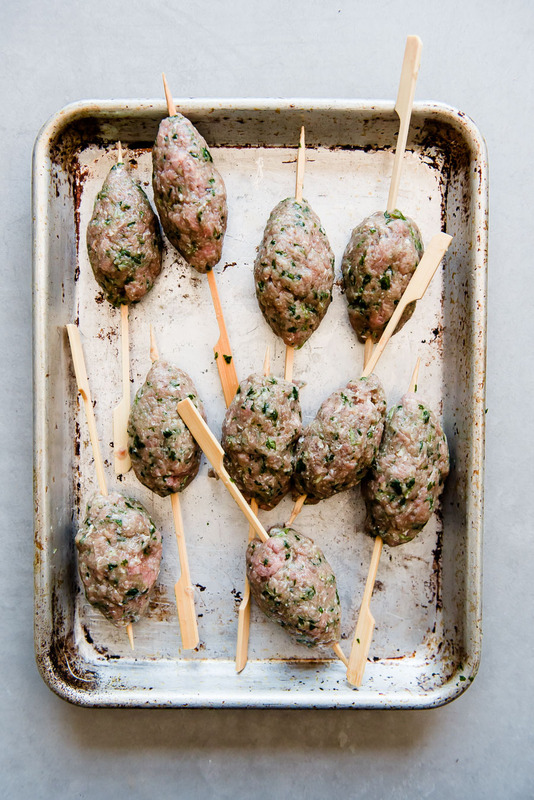 Form meat into 2 inch oblong shapes and thread through a wooden skewer. Refrigerate for 30 minutes. Heat a grill pan over medium high heat. Spray each kefta with cooking spray or brush with olive oil. Place 3-4 keftas on the grill pan and cook for 4-5 minutes per side or until cooked through. You can use a meat thermometer to check for doneness at 165F or sacrifice one and cut it in half to see it is no longer pink. It’s the professional way I check mine. Continue until all the keftas are cooked. You may need to wipe your grill in between if small bits accumulate. Also, flipping them might be prove difficult. Nudge them carefully with a spatula and flip slowly. Transfer to a baking dish and keep warm in the oven until ready to eat. Preheat oven to 400F. Rub artichoke bottoms with olive oil and salt. Roast for 15-20 minutes or until slightly charred. Set aside to cool. In a small food processor, blend the artichoke, garlic and cilantro. Add the tahini paste, water, lemon juice and salt and blend until smooth. Add a little more water if it’s too thick. Preheat oven to 400F. In a small bowl, combine the olive oil, za’atar and a sprinkle of salt. Brush onto each lafa and bake for 5 minutes or until heated through. To assemble, scoop a generous spoonful of tahini onto the lafa, top with kefta and serve with vegetables on the side. Enjoy. *You spy roasted fennel on that plate. yes, I had one that needed to be used up so I sliced it and seasoned with olive oil, salt and pepper and gave it a roast on 425F for 20-25 minutes. Try it!